After a long hard day at school I like nothing better than gathering my family close, lighting the fire (now I REALLY love that!) and settling down for the evening. 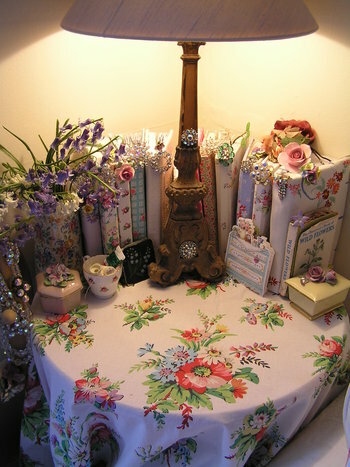 My corner of the sofa has now turned into 'my corner of the room' and it is where I keep my brooches, my floral box files (full of material, patterns, precious things) and my 'Inspiration books'. These are books that I have covered myself with fabric or used old embroidered tray cloths to make covers. I then stick pictures from magazines in them that appeal to me, or inspire me to create, or simply just because they make me feel good - well a girl can dream can't she? I must say it can be a mammoth cutting and sticking session but the end result is surprisingly appealling to me and just flicking through them connects me to my dreams, hopes and ambitions. What I find so amusing is that when Lucy or Alice goes through them they say, "Got one like that, and that, you made that, we even got some like this, is this the same as we have, did you make this?" The pictures tend to be from my favourite magazine 'Country Living' but any home style mag will do! There is a fairly newish one that I like called 'The English Home' too. The good thing is that people are kind enough to pass their magazines on to me..isn't lovely to have good friends!? Actually the time I look forward to most is early November as the Christmas editions are out and I love them, I'm still cutting these out now as I decided to have a seperate book for Christmas pictures. Illness is still lurking in our house and there are alot of children away from school - some have even closed! I would like to thank everyone who has posted such kind comments. It is so good to know you are out there and I am not rambling to myself! Well, my fire is waiting to be lit and the food waiting to be prepared..